José Goméz, a civil rights and liberties scholar who educated countless Evergreen students in working for social justice, died on September 14, two weeks shy of his 71st birthday. Goméz was an influential force at Evergreen for more than 25 years, teaching constitutional law and politics and serving in the deanery for eight years. Before turning to academia, he spent two decades working for community-based organizations, including as the executive director of La Raza Legal Center and the Human Rights Foundation, both in San Francisco. He championed gay and lesbian equal rights from his days as a Harvard law student, through his involvement and work with such organizations as Gay & Lesbian Advocates & Defenders in Boston, and in his role as co-chair of the National Gay and Lesbian Task Force. His fervor for equity and justice was rooted in his youth: He was raised in a family of migrant farmworkers and yearned to fight the oppression that kept them poor. He would go on to become a first-generation college graduate, a Peace Corps volunteer in Brazil, a Fulbright Scholar in Nicaragua, a graduate of Harvard Law School, and the executive assistant to César Chávez, co-founder of the United Farm Workers of America. He also worked as a high school teacher in Costa Rica and a community representative for California Governor Jerry Brown (during Brown’s earlier term in office). Goméz received his B.A. from the University of Wyoming. He earned his J.D. from Harvard following his five-year stint with the United Farm Workers union, where he initially worked as an organizer and boycott coordinator. At Harvard, he founded the Committee on Gay and Lesbian Legal Issues (now called Harvard Lambda), the nation’s first gay rights organization at a law school. As a faculty member, Goméz originated the Evergreen Supreme Court, in which students did legal research, wrote briefs, presented oral arguments, and rendered decisions on real cases. He also played an important role in helping to create the college’s faculty union. To honor Goméz’s memory, donations can be made in his name to one of his favorite organizations on campus, Evergreen’s Center for Community-Based Learning and Action. He was also known for being a natural storyteller with a great sense of humor. “He began even the most serious of lectures with a prolonged joke, while students leaned in, waiting for the punch line,” said colleague Therese Saliba. Shariff joined Evergreen in 1990, serving for 22 years before retiring and being conferred with the title of faculty emeritus in 2012. He taught in the Master of Public Administration program and in the undergraduate curriculum in the areas of public administration, international politics, and political science. He directed the M.P.A. program in 2001-02 and was a founding member of United Faculty of Evergreen. Shariff was devoted to teaching, continuing to do so after retiring, and he was known as a deeply engaged faculty member. “Even after retirement, Zahid stayed intellectually engaged,” said Saliba. He was looking forward to teaching his popular course on imperialism this fall, but shortly before he died, he reluctantly concluded that his health would not permit it. Born in India on March 7, 1939, Shariff was forced to resettle in Pakistan with his family in 1948 as part of the Partition of India. He earned an M.P.A. degree from Karachi University and a doctorate of public administration from New York University before returning to Pakistan to participate in efforts to build a modernized, peaceful nation. Prior to coming to Evergreen, he taught at Brooklyn College and Northeastern Illinois University in Chicago. 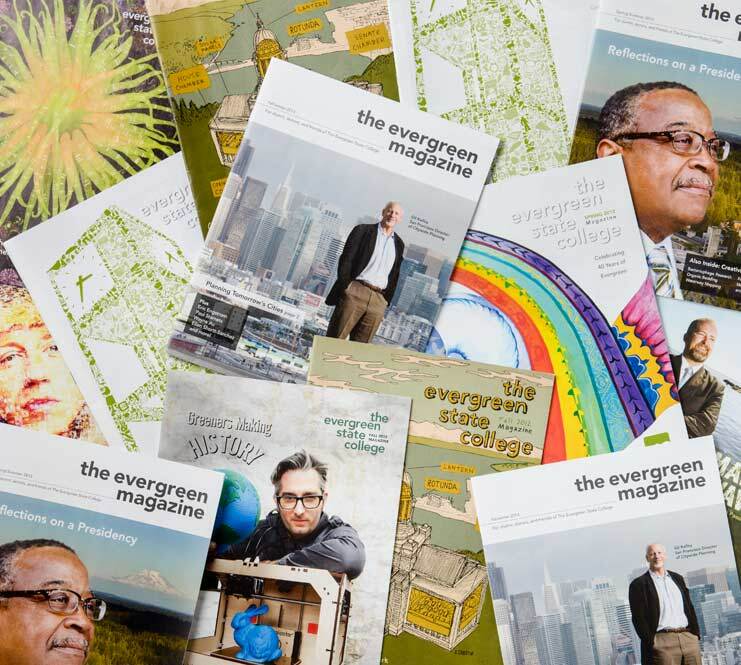 Gifts to honor Shariff’s memory can be made to Evergreen’s Annual Fund. Joshua R. Bogle ‘06, April 19 in Berlin, Germany, where he lived since graduating from Evergreen. Charlotte M. Breckenridge ‘78, July 21 at the age of 85. She was a counselor in the Tacoma School District until her retirement in 2000. Deenie T. Celestine ‘95, April 18 at the age of 75. She was EMS coordinator for the Quinault Indian Nation. Brenda J. Dell ‘09, June 10. She worked for the international program at Saint Martin’s College and at Grays Harbor College. Amy C. Dubin ’75, August 1, 2013. She was an art teacher at Vashon Island High School. Barbara L. Flynn ’89, December 8, 2013. She worked for the Washington State Employment Security Department. Roger Q. Gaines ‘84, May 24 at the age of 79. He was a retired U.S. Army lieutenant colonel. Daniel A. Gourde ‘76, June 10. He was a senior maintenance electrician for the Abernathy Fish Technology Center until he retired in 2010. Susan (Manz) Graham ‘91, May 9. She was a circulation supervisor at Saint Martin’s University library until her death. Andrea S. Green ‘00, June 3. She was a freelance writer and tutor at Washington State University Tri-Cities. Carrie Michi Hatta ‘86, July 25 due to complications related to a longstanding medical condition. Keith Jackson ‘01, September 18, 2013. He was a computer scientist at Lawrence Berkeley National Laboratory. Michael A. Kennedy ‘91, June 26. He enjoyed a 30-year telecommunications career with AT&T, US West, Qwest and CenturyLink.